The B Resort, at Disney Springs, near Orlando is an “artsy” venue with many wonderful sites to choose from for a fantastic wedding ceremony! For those who do not know, Disney Springs is a Walt Disney World Resort shopping attraction. Doug and Ashley chose this gorgeous venue because of it’s great indoor spaces that provide an alternative to the sunny and “warm” outdoors here in Orlando. Also, the staff at the B has great professionals on their preferred lists for their brides and grooms to choose from. All was in place for this couple as they traveled from Ohio with their families and friends to celebrate their “Disney” style wedding. The Mad Hatter was very present throughout their thought process. Lon Tosi, of Celebration, Florida and from the Orlando team of Sensational Ceremonies worked them to create a magical and custom wedding ceremony. It all started with the following gorgeous composition from N.R. Hart:” Legend has it there is always a reason why souls meet. Maybe they found each other for reasons that weren’t so different after all. They were two souls searching and found a home lost in each other. When souls find comfort in one another separation is not possible. The reasons they are brought together are no accident. Maybe she needed someone to show her how to live and he needed someone to show him how to love.” ~N.R. Hart~ How beautiful! The couple elected to conduct a Wine Box Ceremony to replete their beautiful ceremony. They wrote letters to one another and placed them into the box with a fine bottle of wine. On their first anniversary, they will open the box and read their letters to one another. Then they will add letters to the box for future years reading. What a fantastic heritage they will leave their generations to follow! Take a look at the gorgeous Allure Designed Gown that Ashley wore for her special day! The gown stole the evening with its stunning beauty! It is notable that Lori Kelly Photography took the stunning photo of the gown shown with this overview. The “ceremony” photo came from a personal camera. Other amazing professionals made this a memorable affair. Casie Caldwell owner of Sparkleigh Productions kept everything running smoothly. 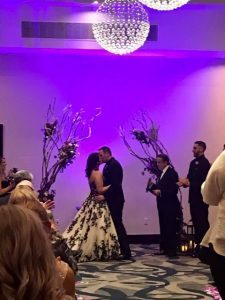 White Rose Productions, the award winning DJ and Lighting company provided the outstanding sound and music for the ceremony as well as the reception. Take a look at the colorful backwall for the ceremony. Spectacular! The beautiful florals for the event were provided by Blue Grass Chic. Leah Harvey Make-Up did a great job of making the already gorgeous bride and her court even more beautiful! Hair is always important, and Liz from Liz Updos did not disappoint. Of course, the B Resort did a wonderful job of providing the catering as well as the venue, and Ocean Hawks complemented that landscape with their amazing rentals. Last but not least, the great people from Cut The Cake provided the gorgeous cake! The team at Sensational Ceremonies wishes you Doug and Ashley much luck and success with your marriage. My your days together be good and long upon this earth!